Earlier this month Griffen’s parents were checking his work for school (explain and relate to an assigned precept) and what they found sent them “over the moon”… It did the same for us, and we can only imagine what his teachers felt when they received it. Sometimes the teacher isn’t giving the bonus points when assignments are completed, he/she gets them…the honest, trusting sharing of an appreciative student, not to mention an endearing and engaging fulfillment of an assignment. 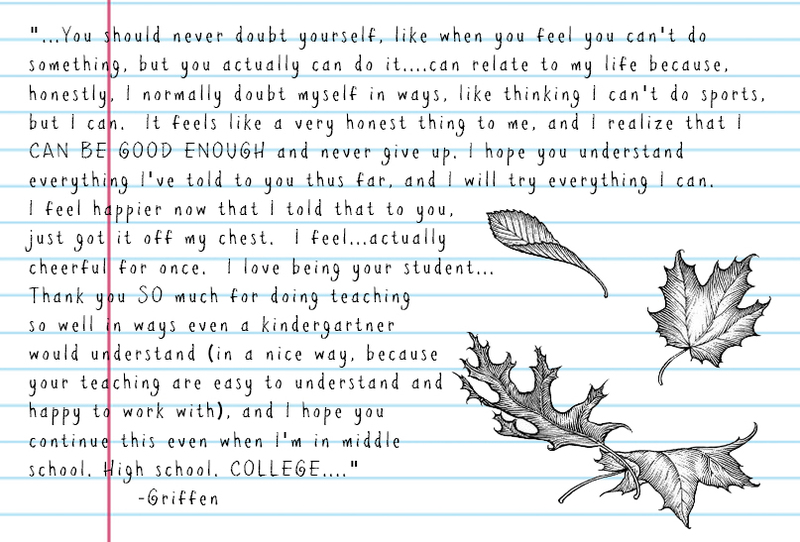 Thanks to Griffen and his parents for allowing us to share this inspiring, heartfelt, unedited message he simply referred to as “homework”. “This precept means to me that you should never doubt yourself, like when you feel you can’t do something, but you actually can do it. I think you chose this precept because it can mean a lot to a child in a way that it feels like you feel it inside you. This precept can relate to my life because, honestly, I normally doubt myself in ways, like thinking I can’t do sports, but I can. It feels like a very honest thing to me, and I realize that I CAN BE GOOD ENOUGH and never give up. I hope you understand everything I’ve told to you thus far, and I will try everything I can. I feel happier now that I told that to you, just got it off my chest. I feel…actually cheerful for once. I love being your student, Mr. ____. Thank you SO much for doing teaching so well in ways even a kindergartner would understand (in a nice way, because your teaching are easy to understand and happy to work with), and I hope you continue this even when I’m in middle school. High school. COLLEGE. Thank you. Innovation is abound when you and Mrs. ___ teaches, and also Ms. _____ as well. : D : D : D : D..wait, I’m going off topic, aren’t I?.. Sorry, I just answered all the questions and I’m not sure how to continue at this point, OK? Thanks for teaching me so far. I feel happy. Sorry for doing this later than expected. When I wanted to do it on Thursday, my internet went down due to cleaners getting the Wi-Fi router wet. Had to wait until yesterday to get on the Internet. It was excruciating. At least my family went to Arturo’s (the pizza shop, Griffen recommends) the night before I got back on. You’re a very nice teacher! (out of things to say at this point) (ONE MORE THING) It’s awesome that you teach. Is this too many lines for one answer now? Not sure.